1000 round case of WOLF ammo .223 Steel case full metal jacket 55 grain load. This is the most mainstream round that you can buy for the steel cased .223’s. It offers excellent versatility and a balanced approach to your shooting needs giving a wide range of use cases. It is suitable for plinking and target work in short to moderate distances (out to 150 yards) – it’s sweet spot. It is (where not prohibited specifically in the regulations) capable of hunting work from ground squirrels and coyote up to deer sized game. It is usable for personal defense, though the full metal jacket may not be the most ideal cartridge, as the power and velocity offer a ton of range for a defensive shooter. It is best served out of the middle range of barrel twist rates for mainstream production barrels somewhere between 1:7 to 1:10 but best at 1:8 and 1:9 generally. The round will easily work given different needs out of any rifle or handgun chambered in .223 Remington, regardless of the twist rate but it is optimized for that rate. A non-reloadable cartridge, that is best suited for use in semiautomatic military style weapons or those guns not built to exceed tolerance tightness of normal factory mainstream firearms due to the steel case. 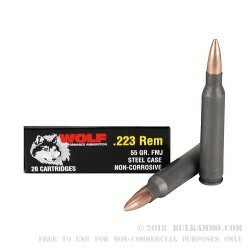 Great Value: 1000 rds of .223 at a great price. Bulk Ammo has the ammo I needed in stock and ready to ship at a great price. My new stop for ammo.